This match goes to the floor early with Valletta doing his brawling act but eventually, Aoyagi gets back into the ring and hits a Plancha on Valletta. When then get rest holds from Valletta and more brawling into the crowd. What made this match passable was Aoyagi’s performance. He always sells well and played the role of the plucky underdog for most of the match. This was a fun little match. Lee showed up motivated and Yoshitatsu has been pretty good so far in the tournament. While not a spectacular match this was a fun back-and-forth and both guys get in a fair amount of offense. And the crowd heat was pretty strong which helped. Lee even brought some surliness to this match which was a nice touch. 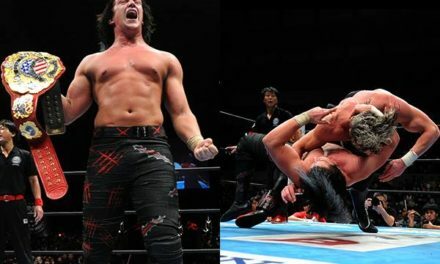 He did things like dare Yoshitatsu to re-enter the ring while he was on the floor and Lee was holding the ropes open for him. And at other parts of the match, Lee gives Yoshitatsu little shoves and kicks when he’s down in a show of dominance. Okay, this might be a divisive match given some of the tactics Adonis used, but I liked it. Adonis looks like he’s going to wrestle a traditional match, beginning with working over SUWAMA with a headlock. SUWAMA lariats Adonis to the outside and here’s where things might get controversial. Adonis grabs a steel chair from under the ring and hits SUWAMA in the back with it while referee Kyohei Wada’s back is turned. Back in the ring and Adonis works over SUWAMA for a bit. SUWAMA then regains the momentum, but Adonis manages to go toe-to-toe with the former Triple Crown Champion for the rest of the match, countering things like the Last Ride and hitting a Running Powerslam for a near fall. Adonis even manages to kick out of a SUWAMA Backdrop. Now the finish is going to be the most controversial part. Adonis counters another Last Ride attempt by biting SUWAMA’s hand. But that’s not all! Adonis grabs a chair and then SUWAMA grabs it from him. Wada then grabs the chair out of SUWAMA’s hand and while Wada’s back is turned, Adonis low blows SUWAMA. Adonis then hits a School Boy on SUWAMA for a 2.9. Adonis then follows that up with a Lariat and a nasty looking Northern Lights Bomb that spiked SUWAMA right on his head for the victory. As my colleague Thomas Fishbeck has noted, Dylan James is good now and this match is more proof. This match goes to the floor early which has been a trend on this show. We get Miyahara’s usual outside schtick like headbutts and wrapping his opponent’s head around the ring post. James goes to chop Miyahara on the outside and the Triple Crown Champion ducks and James hits the ring post with his chop. He then begins to sell his right arm, doing stuff like favoring it after he has to use it to land strikes. This match went over 20 minutes and was worked a very main event style with a main event style build to the closing stretch. James and Miyahara have really good chemistry together, which is not something I’m sure fans were expecting when they saw that James had joined All Japan. What helps their chemistry is that James plays the big hoss role well while Miyahara has tremendous control over the crowd and can almost instantly get them behind the Champ by acting he is in any kind of danger. While obviously, someone like Miyahara can make almost anyone look good, it’s quite clear that James has improved his ring work. Closing stretch was really hot with the caveat that by this point James had stopped selling his right arm. I’m not a selling fetishist but it really did stand out because how much he was selling it earlier on. Nothing much to say other than this is another solid top-to-bottom Champion Carnival show, even the undercard matches were fun. Worth watching the whole thing if you’ve got the time. The whole show is just under two and a half hours.